The future of the world’s coral reefs is uncertain, as the impact of global heating continues to escalate. However, according to a study published today in Nature Climate Change, the response of the Great Barrier Reef to extreme temperatures in 2017 was markedly different to one year earlier, following two back-to-back bouts of coral bleaching. Remarkably, corals that bleached and survived 2016 were more resistant in 2017 to a recurrence of hot conditions. “Dead corals don’t bleach for a second time. The north lost millions of heat-sensitive corals in 2016, and most of the survivors were the tougher species. 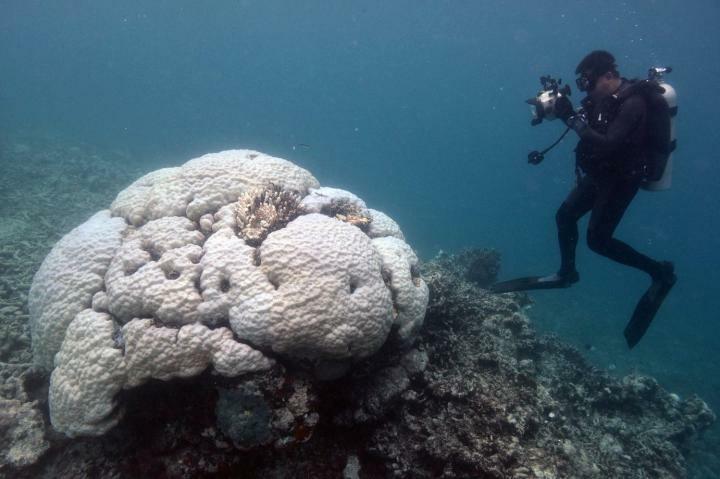 As a result of bleaching, the mix of species is changing very rapidly,” said lead author Prof Terry Hughes, Director of the Australian Research Council Centre of Excellence for Coral Reef Studies (Coral CoE), headquartered at James Cook University. “We were astonished to find less bleaching in 2017, because the temperatures were even more extreme than the year before,” he said. The new research highlights the extent of damage, or “geographic footprint” of multiple coral bleaching events across the 2,300 km length of the world-heritage listed area. The back-to-back heatwaves bring the total number of mass bleaching events on the Great Barrier Reef to four over the past two decades (in 1998, 2002, 2016 and 2017). The scientists found that only 7% of the Great Barrier Reef escaped bleaching entirely since 1998, and after the 2017 event, 61% of reefs have now been severely bleached at least once. “We found, using the National Oceanic and Atmospheric Administration’s (NOAA) satellite-based coral bleaching tools, that corals in the north of the Great Barrier Reef were exposed to the most heat stress in 2016. A year later, the central region saw the most prolonged heating,” said co-author Dr Mark Eakin, from NOAA’s Coral Reef Watch program, in Maryland, USA. The southern third of the Great Barrier Reef was cooler in both years due to local weather conditions, and escaped with only minor bleaching. “The outcome in 2017 depended on the conditions experienced by the corals one year earlier. We called that ‘ecological memory,’ and show that these repeating events are now acting together in ways that we didn’t expect,” said Prof Hughes. “We’ve never seen back-to-back mass coral bleaching before on the Great Barrier Reef, in two consecutive summers. The combined footprint has killed close to half of the corals on two-thirds of the world’s largest reef system,” said Dr Hoey. “We need urgent global action on greenhouse emissions to save the world’s coral reefs. Australia should be – but regrettably isn’t – at the forefront of tackling global heating,” said Prof Hughes.